Hanging art work raises few questions. Home owners should ask themselves how high should a painting be hung on the wall, how to decide what goes where, what hanging accessories are needed and what is the most appealing location. Pictures should hang just above eye level when viewed standing. Use 2 screws for each panel. This will ensure they are flush with the wall (it is not recommended to use hanging wire). Consider lighting to emphasize your arrangement. When lighting is directed to the painting(s), it commands even more attention. Pay attention to "balance" in your entire room. Be careful not to put everything in one part of a room. Leaving the other walls bare will throw the balance of the entire room off. If the artwork is made of few pieces they should be close enough to each other to relate, but leave a little breathing room. Use a measuring tape to be sure that the distance between several pictures that will hang in a row is equal. Relate art to wall size. Choose smaller paintings for narrow walls and large-scale paintings for big wall spaces. Relate art to furniture size. 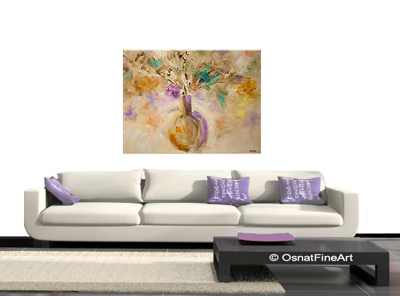 When hanging a painting over a sofa or other furniture, make sure the painting is no wider than the furniture. Choose smaller paintings for narrow walls and large-scale paintings for big wall spaces. When hanging paintings in a stairwell, prefer smaller paintings to go diagonally along the steps. It will add excitement to the composition and decor. Optional: To keep your pictures hanging straight, take a piece of mounting putty and place it in the corner of the picture between the picture and the wall. You should never have to straighten the picture again. Mounting putty can be purchased at your local hardware store.